Bali is the ultimate oasis for couples, whether you’re on your honeymoon or planning to pop the question. This island offers breath-taking views of the ocean, natural landscapes and cultural monuments, inherently creating a myriad of romantic settings for couples. With plenty of romantic things to do in Bali, we highlight our favourite ones to fit adventurers, cultural enthusiasts and rejuvenators. Take a break from exploring the island and book a tranquil spa treatment for you and your partner. As a haven for wellness activities, Bali offers a plethora of spas perfect for couples. 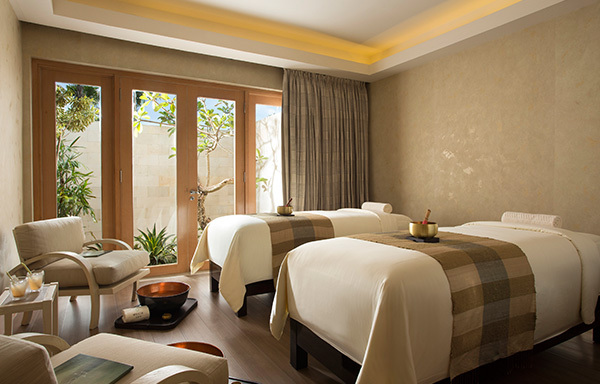 The Mulia Spa is the perfect place to visit for your honeymoon for a full day of pampering. It offers everything you need for the complete relaxation package, from an outdoor meditation area to a Zen Spa bar for a refreshing fresh juice. Bali has become a paradise for yoga, perfect for everyone ranging from beginners to dedicated yogis. Sign up for a couples yoga class and be in a harmonious state of zen with your significant other. The multitude of yoga studios available lets you to choose from full day retreats or a morning or afternoon session. Experience serenity among the beautiful landscape of Bali and feel revitalized after your relaxing yoga retreat. 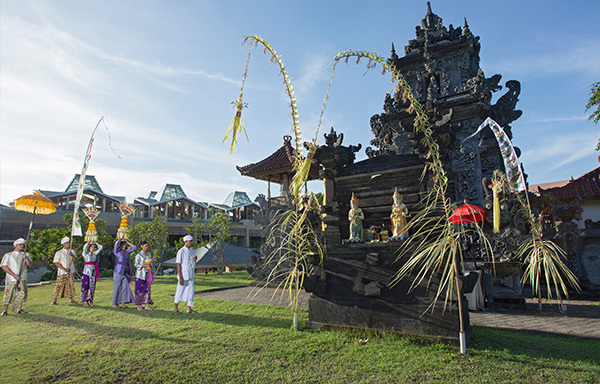 Bali is deeply rooted within rich traditions through religion and art. Couples seeking to immerse themselves into the local culture will be awestruck with these romantic yet cultural activities. No trip to Bali is complete without visiting its temples. The most famous are Uluwatu Temple and Tanah Lot, but there are more than 5,000 temples to choose from. If you’re looking for a romantic thing to do for your other half, surprise them with a visit to the temples during sunset. Then indulge in a private dinner before the captivating views of the temple overlooking the ocean afterwards. Whether you want a view from above, by the water or even on the water, Bali offers endless options for a romantic evening. Immerse yourself and your significant other into the Balinese culture with a private cooking lesson specializing in authentic Indonesian cuisine. Or opt to do this activity solo to pick up some skills to impress your significant other when you return home. After all, food is the way to a man or (women’s) heart. Bali may be known for its slower pace, but adventurous couples will still be able to find plenty on activities to keep them energized on the island. This challenging yet rewarding hike is an activity not for the faint of heart. Daring and adventurous couples will feel exhilarated once they reach the top of Mount Batur. Capture the perfect romantic moment and be in awe by the spectacular sunrise. If you and your partner love the outdoors, this once in a lifetime adventure should be added to your list! Although Bali is known for its pristine beaches and surfing, its underwater world that truly sets this island apart from others. Swim hand in hand with your partner as you discover vibrant coral reefs in the crystal-clear waters. No matter if you’re a beginner snorkeler or advanced diver, you will be enchanted by the vast ocean life. For the thrill-seeking couples out there, take your trip to the next level and see Bali from above! Splurge on the ultimate romantic activity to see the beautiful views of Bali without the mass of tourists. You will pass over iconic landmarks of Bali such as its temples, volcanoes, rice fields and untouched beaches. For more information and recommendation on tours, visit our Front Desk and our team will gladly help you in making your romantic trip to Bali a memorable one.